Juha and Saija Kontio run the farm together. 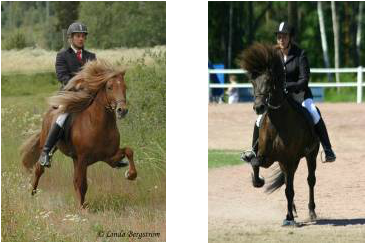 Both of them are active competition riders and they are well known also for their success in breeding shows. Juha is multiple Finnish champion in tölt and fourgait combination with Rödull frá Holsmula. He´s been medalist in almost every championships since he started competing with various horses. Best international result so far is 8th position in tölt at the WC Austria 2011. Saija has won many medals in finninsh championships since she started competing. She´s Finnish Champion in T2 with our first price breeding mare Freyja frá Bakkakoti. Both of them have been selected to National Team of Finland many times since 2003. Sometimes they have gone to the team and sometimes stayed at home for various reasons. Juha and Saija have presented many hoses in Breeding shows with good results. Usually it´s Juha who is on the saddle but nobody can do it well just by himself. Together they have trained and presented many horses with First price and high Second price. For example all of their own horses with judgement have been presented and trained by Juha and Saija. Highligts in breeding shows: Grágás frá Toftum rid. 8.15 in 2003, Vegsemd frá Galtanesi rid. 8.07 ( 4-gait ) in 2004, Geysir frá Sahala rid. 8.06 in 2004, Rödull frá Holtsmula tot. 8.17 in 2006 Fengur frá Súluholti tot. 8.14 in 2006, Magnus frá Guldbaek tot. 8.00 in 2006, Von frá Moeidarhvoli tot. 8.12 in 2007, Freyja frá Bakkakoti tot. 8.01 in 2007. Álfur frá Rettarholti tot. 8.09 in 2009.